Your teeth are covered with a sticky film called plaque that can contribute to tooth decay and gum disease. Plaque contains bacteria, which following a meal or snack containing sugar can release acids that attack tooth enamel. Repeated attacks can cause the enamel to break down, eventually resulting in cavities. Plaque that is not removed with thorough daily brushing and cleaning between teeth can eventually harden into calculus or tartar. This makes it more difficult to keep your teeth clean. When tartar collects above the gum line, the gum tissue can become swollen and may bleed easily. This is called gingivitis, the early stage of gum disease. Scaling and root planning is a deep cleaning below the gum line used to treat gum disease. If gum disease is caught early and hasn’t damaged the structures below the gum line, a professional cleaning should do. If the pockets between your gums and teeth are too deep, however, scaling and root planning may be needed. This deep cleaning has two parts. Scaling is when your dentist removes all the plaque and tartar (hardened plaque) above and below the gum line, making sure to clean all the way down to the bottom of the pocket. Your dentist will then begin root planning, smoothing out your teeth roots to help your gums reattach to your teeth. Scaling and root planing may take more than one visit to complete and may require a local anesthetic. After a deep cleaning, you may have sensitivity for up to a week. To prevent infection, control pain or help you heal, your dentist may prescribe a pill or mouth rinse. Your dentist may also insert medication (subantimicrobial-dose doxycycline) directly into the pocket that was cleaned. Your dentist will schedule another visit to see how your gums have healed and measure the depth of your pockets. If they have gotten deeper, more treatment may be needed. Good dental care at home is essential to help keep gum disease from becoming more serious or recurring. Some ointments and antiviral medications may shorten the outbreak’s duration and alleviate discomfort and pain. Just as you have doctor visits for prenatal checkups, it’s also important to visit your dentist for prenatal dental care. Your dentist can help discuss changes in oral health during pregnancy and what to look for. There is a connection between your health during pregnancy and your baby’s health, so visiting your dentist during pregnancy is essential. During pregnancy, the changing hormone levels can leave your mouth more vulnerable to bacteria and plaque, both of which create tender gums during pregnancy. This can put you at greater risk for tooth decay and gum disease. Gum inflammation is more likely to occur during the second trimester. Your gums may be swollen, tender, and may bleed a little during brushing and flossing. Although pregnancy does not cause periodontal disease, pregnancy can exacerbate this condition, which can result from untreated gingivitis. Pregnancy tumors are overgrowth’s of tissue appear that on the gums, most often during the second trimester. They are non-cancerous growths believed to be related to excess plaque. They may bleed easily and will usually disappear after the baby is born. Floss gently once a day. Visit your dentist regularly for a professional cleaning and check-up. Ask your dentist about an antimicrobial mouth rinse to help combat the increase of plaque. If you have morning sickness and vomiting, rinse your mouth with a teaspoon of baking soda mixed with water. This will help keep stomach acids from attacking your teeth and causing decay. Eat a diet rich with calcium, B12 and vitamin C to help keep gums healthy. Temporomandibular joint and muscle disorders, commonly called “TMJ,” are a group of conditions that cause pain and dysfunction in the jaw joint and muscles that control jaw movement. Some estimates suggest that TMJ disorders affect over 10 million Americans. These conditions appear to be more common in women than men. 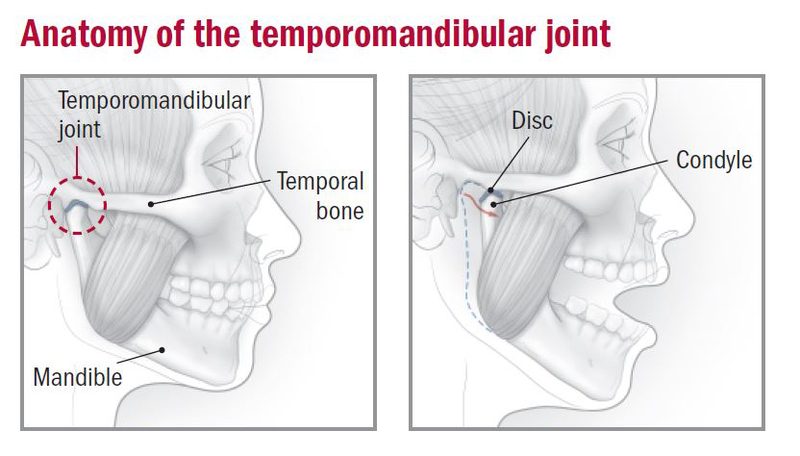 Trauma to the jaw or temporomandibular joint plays a role in some TMJ disorders, but in most cases, the exact cause of the condition is not clear. For many people, symptoms seem to start without obvious reason. There is no widely accepted, standard test now available to correctly diagnose TMJ disorders. Your doctor will note your symptoms, take a detailed medical history, and examine problem areas, including the head, neck, face, and jaw for tenderness, clicking, popping, or difficulty with movement. The doctor might also suggest imaging studies such as an x-ray. Because the most common jaw joint and muscle problems are temporary and do not get worse, simple treatment may be all that is necessary to relieve discomfort. Short term use of over-the-counter pain medicines or nonsteroidal anti-inflammatory drugs (NSAIDs), such as ibuprofen; the use of a stabilization splint, or bite guard, that fits over upper or lower teeth may provide relief. Surgical treatments are controversial, often irreversible, and should be avoided where possible. There have been no long-term clinical trials to study the safety and effectiveness of surgical treatments for TMJ disorders. Dentists use lasers in a variety of procedures involving the inside of the mouth, be it to remove overgrown tissue, to reshape the gums, or to whiten teeth. 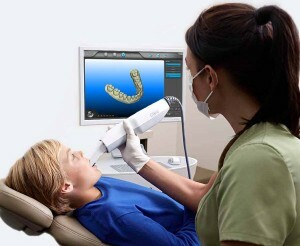 Sometimes, laser dentistry is ideal for children who become anxious or afraid when having dental work done. Dentists choose laser dentistry because of distinct benefits that make the procedures go more smoothly, and also reduce discomfort and healing time for patients. The two main types of lasers dentists use during laser procedures are hard tissue and soft tissue lasers. Each laser uses a different wavelength that makes it appropriate for cutting into that specific type of tissue. Preparing teeth for dental fillings. Dealing with restricted tongue movement. Reshaping the gums to create a more pleasing smile. Removing folds in oral soft tissues caused by dentures. Whether you’re having laser gum surgery or hard tissue work, expect an easier procedure and a shorter recovery time. Digital impressions represent cutting-edge technology that allows dentists to create a virtual, computer-generated replica of the hard and soft tissues in the mouth using lasers and other optical scanning devices. The digital technology captures clear and highly accurate impression data in mere minutes, without the need for traditional impression materials that some patients find inconvenient and messy. The impression information then is transferred to a computer and used to create restorations, often without the need for stone models. Reduced possibility of impression-taking errors and elimination of material inaccuracies for fewer restoration mistakes. 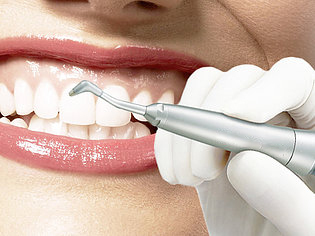 The scan of the teeth being restored, as well as the opposing teeth and bite, can be completed in just three to five minutes. The digital impression can be stored electronically indefinitely, which saves space, contributes to efficient recordkeeping, and supports a paper-free environment. Green dentistry and eco-friendly aspects include eliminating the need for disposable plastic trays and impression materials, which otherwise would be polluting landfill space; digital data is eliminated with the “delete” button. With milled models, you have a solid model. Dies are precision-fit in the model with no movement, and all dies are captured in one model. This gives greater accuracy when restoring multiple units, such as veneer cases. There is no contamination from the patient and no die spacer is required. Bell’s palsy is a condition in which the muscles on one side of your face become weak or paralyzed. Bell’s palsy causes sudden, temporary weakness in your facial muscles. This makes half of your face appear to droop. Your smile is one-sided, and your eye on that side resists closing. Bell’s palsy, can occur at any age. The exact cause is unknown. It’s believed to be the result of swelling and inflammation of the nerve that controls the muscles on one side of your face. Or it might be a reaction that occurs after a viral infection. For most people, Bell’s palsy is temporary. Symptoms usually start to improve within a few weeks, with complete recovery in about six months. 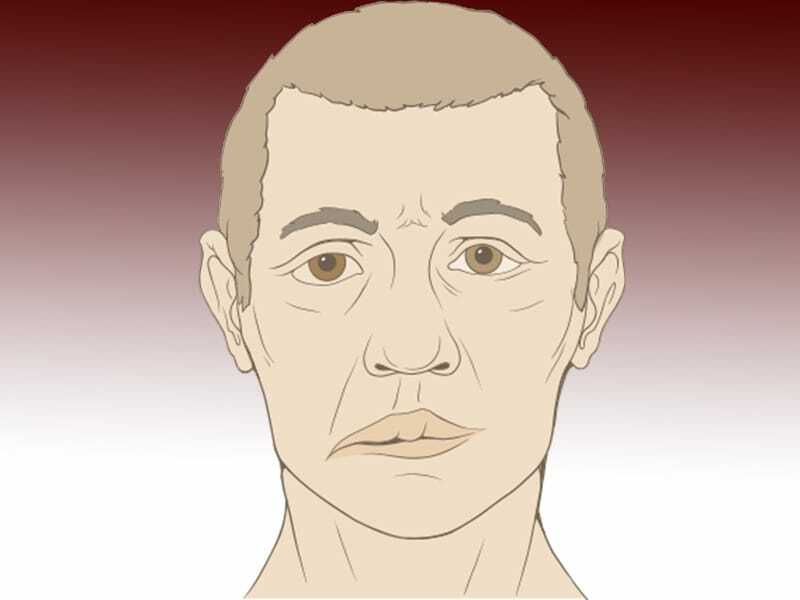 A small number of people continue to have some Bell’s palsy symptoms for life. Rarely, Bell’s palsy can recur. There’s no specific test for Bell’s palsy. Your doctor will look at your face and ask you to move your facial muscles by closing your eyes, lifting your brow, showing your teeth and frowning, among other movements. Most people with Bell’s palsy recover fully — with or without treatment. There’s no one-size-fits-all treatment for Bell’s palsy, but your doctor may suggest medications or physical therapy to help speed your recovery. Surgery is rarely an option for Bell’s palsy. A post and core crown is a type of dental restorstion required where there is an inadequate amount of sound tooth tissue remaining to retain a conventional crown. A post is cemented into a prepared root canal, which retains a core restoration, which retains the final crown. When deciding whether or not a tooth requires a post and core crown rather than a conventional crown, the following must be established. The post is a small rod, usually metal, that is inserted into the root space of the tooth and protrudes from the root a couple of millimetres. The post is then used to hold the core or a filling in place. Because the post is inserted into the root canal, a post and core can only be made for a tooth that has had root canal treatment. The core replaces missing tooth structure in preparation for making a new dental crown. 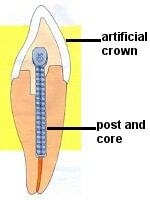 The core is then utilized to hold a dental crown in place. Why are post and cores needed ? A great deal of a dental crown stability depends on the amount of tooth structure that extends into its interior. If very little tooth structure occupies this space, the crown will be easily dislodged, especially by forces directed at its side. Basically, the core is rebuilding the tooth so it is closer to its original dimensions. 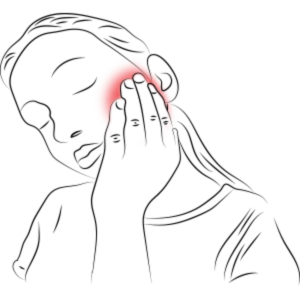 Hence, the crown’s stability will greatly increase, and therefore its long-term chances for success are maximized. Dental Onlays. Onlays also fit inside the tooth, but extend onto the chewing surface of a back tooth to replace one or more cusps. 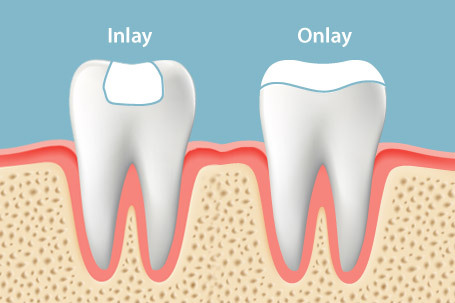 … It is difficult to determine when inlays or onlays can be used instead of crowns or caps. Ask your prosthodontist if you are a candidate for a tooth-colored inlay or onlay. A dental implant is an artificial tooth root that is placed into your jaw to hold a replacement tooth or bridge. Long term fixed replacement of missing teeth without cutting adjacent teeth (done for fixed bridges or FPD). Dental implants can restore oral health, form and function of the dentition, improve esthetics. When you should consider getting dental implants? Replacing All of Your Teeth If you are missing all of your teeth, an implant-supported full bridge or full denture can replace them. Next best thing to healthy, natural teeth. Strong and stable, a dental implant restores a lost tooth so that it looks, feels, fits and functions like a natural tooth. Other options can lead to bone deterioration, and may interfere with eating, smiling, speaking and other activities of everyday life. Built to last. Dental implants are a long-term solution. Retain your natural face shape, and smile. Keep your teeth in your mouth – not in a cup. You don’t have to keep your removable dentures in a cup. They are in your mouth comfortably. Eat your favourite foods! Taste and enjoy the foods you love without hesitation. You can bite naturally, eat virtually anything you want and, unlike removable dentures that can feel uncomfortable, you can experience the full taste of the food you eat with dental implants, too. Keep teeth in place – silently. More predictable than other repair and restoration methods. The Dental Arcade, #620, Sector 18-B, Chandigarh, Pincode - 160 018.